What role should breed – breed identification and breed labeling – play in today’s animal shelters? Current research has helped us understand that focusing on breed is not an effective approach to successful, progressive animal sheltering. Too many dogs are mislabeled, too many assumptions are made based on behavior traits associated with a breed label, and too many dogs are unfairly penalized for the breed label they’re assigned. The solution isn’t that we need to get better or work harder at identifying breeds or breed labeling the dogs. Rather, the next phase in the evolution of animal sheltering is to put the focus where it belongs: assessing all dogs as individuals, first and foremost. Breed is just one part of any individual dog – as is their socialization, training, genetics, environment, etc. – but traits related to breed are not the whole dog. The whole dog is the individual. Breed traits are a just a possible slice of the pie. To go forward, we must focus on the whole dog. It can be a challenge for all of us to think outside the breed box, but the research is clear: shelters need to stop wasting time and energy trying to get better at breed identification and get to know the dogs as individuals instead. In today’s animal sheltering world, it’s critical to the success of our work. Please note that breed traits don’t apply to mixed breed dogs. Mixed breed dogs are not any breed of dog at all. Pure breed dogs are bred from from closed gene pools. Mixed breed dogs are not from closed or coherent gene pools and cannot be considered a member of any breed. They have more in common genetically with ALL dogs, then any one breed in particular. We believe that honesty is the best policy. The overwhelming majority of dogs in shelters are mixed breed dogs (the ASPCA has reported that up to 75% of dogs are of mixed heritage). And research tells us that visual identification of mixed breed dogs is highly inaccurate. Unless you know what a dog’s breed mix is for sure – you know the parents or have paperwork – speculating about the possible breed mix is just a guess. The only thing we recommend is being honest. 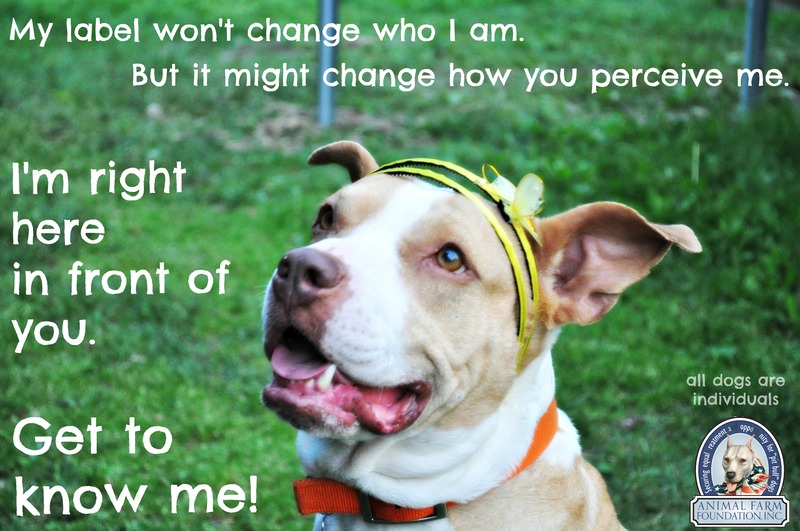 If all you have is a visual inspection and no pedigree, then you’re guessing at a dog’s breed or breed mix when you choose to label them as “pit bulls”. You can label the dogs however you choose, but be careful not to make behavior predictions based on this guess and don’t imply that a label accurately indicates anything about a dog’s suitability for adoption or what kind of home he needs. The label doesn’t change the dog, but often the labels will change how we perceive the dog. In the past, we used to think that we needed to get better at breed labeling dogs, but then Dr. Voith’s research showed us that we cannot get better at it. And Dr. Marder and Janis Bradley taught us that there is behavior variability within each breed, and even more among breed mixes, so that we cannot possibly predict a dog’s behavior based on breed alone. Each dog is an individual. Help adopters to see past labels and get to know the dog’s actual pet qualities. We want to call our dogs of unkown origins “mixed breed” or “American Shelter Dogs”, but the shelter software doesn’t give us that option. How should we lable the dogs? We take lost and found reports at our shelter. Does getting better at breed identification improve lost and found reporting? No, focusing on identifying breed and breed mixes is not the best way to reunite owners to lost pets. No matter how “good” you can get at guessing breeds, you still might guess wrong or the owner might label them differently than you do. The more accurate approach is to focus on the physical description of the dog: color, weight, any identifying characteristics, where the dog was found, etc. Owners who believe their dog matches that physical description should then visit the shelter to identify them in person. We recommend taking photos of all found dogs and posting them online, either on your website or on social media. Our shelter works with pure breed rescue groups. Don’t we need to get better at breed identification, so we can send them dogs? No, you don’t need to get better at guessing breeds. A simple photograph of the dog in question, emailed to the rescue group, will help them decide if the dog in question is a dog they’re interested in helping. If they choose to come meet the dog in person, it’s based on the photo you sent them and their opinion of the dog’s breed. They’re the experts on the breed they work with, so let them make the call via photo, or better yet, a video. We know there are even more questions on this topic and we will continue to address them. However, the answer to all of these questions and many more isn’t to get better at identifying the breed – to do so would be conforming to an outdated shelter system model that research has helped us all outgrow. The real solution is to be progressive in your shelter policies and assessments and change the system! Focus on the individual dogs, first and foremost. There is limited time and resources when working in the busy shelter environment. Rather than asking your staff to get better at guessing dog breeds labels – which research has proven over and over to be inaccurate – help them spend that time gathering information about each individual dog as a whole. What they discover about a dog’s personality will be far more valuable to adopters than any label. Focus on getting to know the dogs in front of you and help your organization evolve!